There is some restriction for me to use negative word online. But I don’t like summer. Two things are good in Summer Mango and Cricket. In Gold Coast there is huge production of mangoes this year. I am so excited to make pickle with it and preserve it for long. I use cinnamon stick which gives a distinctive flavour; though you can make Amer Morobba / Mango Marmalade without cinnamon. Shell lime(chun) is used to remove the sourness or mango. 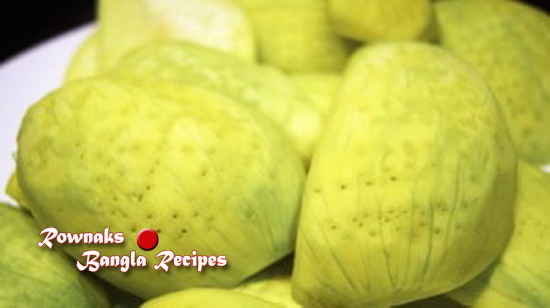 You will find Shell lime(chun) in Indian grocery. Hope we will enjoy the flavour of Amer Morobba / Mango Marmalade and don’t forget like my facebook page or join my facebook group to keep in touch with me. Thanks. 1. Peel the skin of the mangoes and deseed it. Cut into large pieces(we will take only flesh) and soak the mango in water about 2 hours. 2. Take out mango pieces from water and poke the flesh with a fork at several places. 3. Dissolve shell lime in 2 litre water(enough water to soak mango pieces properly) and soak mango pieces for 3-4 hours. 4. Drain the water completely and waste well. Spread them on a plate to dry for 1 hour. 5. Take water, sugar and cinnamon stick in a heavy bottomed pan and heat it on medium temperature till sugar is dissolved. 6. Add mango pieces and cook it 40 minutes on medium heat. 7. Turn off the heat and let it cool down overnight. 8. Heat the mango again till syrup becomes sticky and coat mango pieces well. 9. 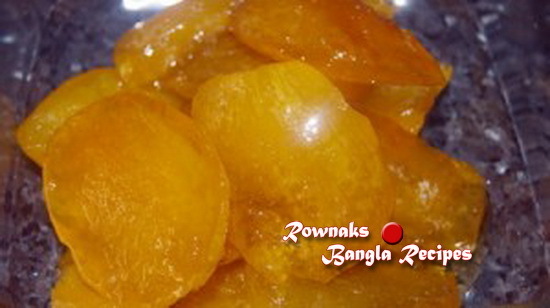 Keep Amer Morobba / Mango Marmalade in a air tight container. 1. Take firm raw mango. 2. Amer Morobba / Mango marmalade can be kept without refrigeration for almost a month and in the refrigerator till it will stay 4-6 months.